Publisher: Harper Collins, 2014. 319 pages. This book is subtitled "A novel of the Great War," and Ms. Winspear has made a study of WWI in England. In this novel she tells the story of one family, and how the war affected them. Kezia Marchant and Dorrit Brissenden have been friends since their schoolgirl days, and as the novel opens, Kezia is about to marry Dorrit's brother Tom. Much is changing between the two young women, who have chosen different paths, and their struggle is represented by Dorrit--Dorothy--changing her name to a different diminutive, Thea. That change represents her dive into the world of women's suffrage and, while Kezia shifts from parson's daughter and self-supporting teacher to farmer's wife. When war breaks out only months after the marriage, everything shifts again, and the heart of the story is how they all cope. Ms. Winspear couldn't write a bad book, but this is a bit unexpected for fans of her Maisie Dobbs mysteries. It took me a bit to engage with the characters, and to find the rhythm and direction of the story. Once the war begins, and (this is no spoiler, really--it's the inevitable plot development) Tom goes to fight, the book began to fall into place for me. The "lies" of the title are the letters each writes to the other, making light of their struggles and creating a comforting fiction for the other. In particular, Kezia keeps up Tom's spirits by describing the meals she is cooking for him--completely imaginary meals, as shortages leave her with little food. 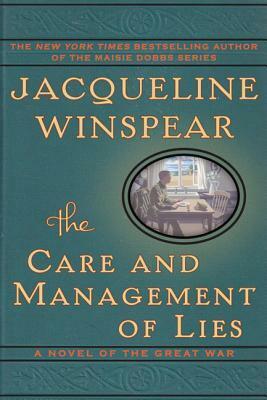 What Winspear does with those "lies" is imaginative and powerful. Ms. Winspear depicts the war from both sides--the trenches and the "home front"--very well, and this may be the strongest aspect of the book. The story is about the three-way relationship between the two girls and the man they both love, but I admit those relationships felt a bit thin to me. I didn't quite believe in them, but I completely believed the world and the lives Winspear painted. That's almost enough. Though I felt that something was a bit off in the book, and I was discontented with the ending (not necessarily because it was bad, but because it wasn't the one I wanted), The Care and Management of Lies is a moving look at the Great War, and well worth the reading. Just don't look for Maisie Dobbs here. This is a different kind of book, meant for those who like more serious fiction and for those who (like me) are fascinated by that period of history. Full Disclosure: I checked The Care and Management of Lies out of my library, and received nothing from the writer or publisher in exchange for my honest review. The opinions expressed are my own and those of no one else. I am disclosing this in accordance with the Federal Trade Commission's 16 CFR, Part 255: "Guides Concerning the Use of Endorsements and Testimonials in Advertising."